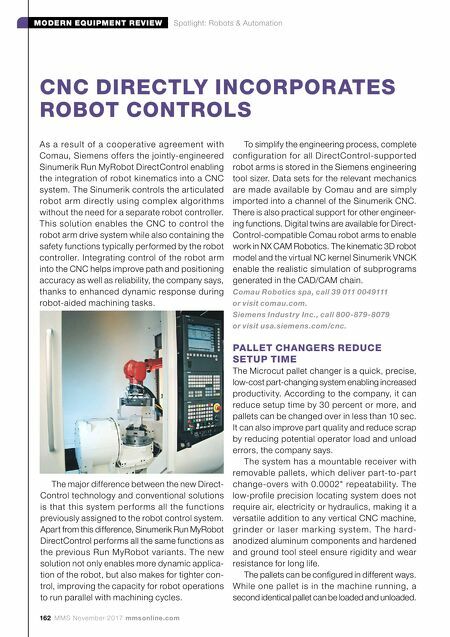 162 MMS November 2017 mmsonline.com MODERN EQUIPMENT REVIEW Spotlight: Robots & Automation As a result of a cooperative agreement with Comau, Siemens offers the jointly-engineered Sinumerik Run MyRobot DirectControl enabling the integration of robot kinematics into a CNC system. The Sinumerik controls the articulated robot arm directly using complex algorithms without the need for a separate robot controller. This solution enables the CNC to control the robot arm drive system while also containing the safety functions typically performed by the robot controller. Integrating control of the robot arm into the CNC helps improve path and positioning accuracy as well as reliability, the company says, thanks to enhanced dynamic response during robot-aided machining tasks. CNC DIRECTLY INCORPORATES ROBOT CONTROLS To simplify the engineering process, complete configuration for all DirectControl-suppor ted robot arms is stored in the Siemens engineering tool sizer. Data sets for the relevant mechanics are made available by Comau and are simply imported into a channel of the Sinumerik CNC. There is also practical support for other engineer- ing functions. Digital twins are available for Direct- Control-compatible Comau robot arms to enable work in NX CAM Robotics. The kinematic 3D robot model and the virtual NC kernel Sinumerik VNCK enable the realistic simulation of subprograms generated in the CAD/CAM chain. Comau Robotics spa, call 39 011 0049111 or visit comau.com. 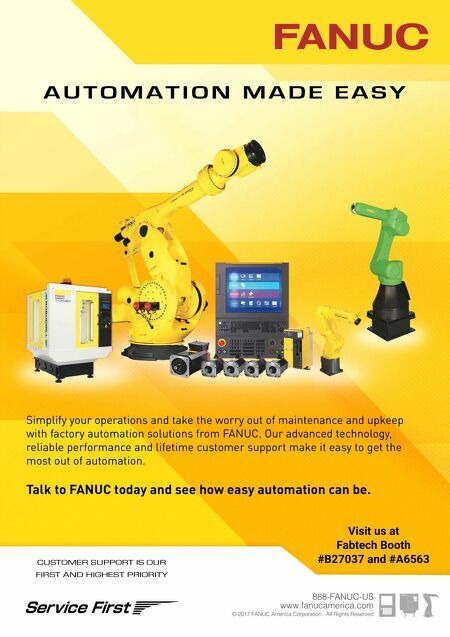 Siemens Industry Inc., call 800-879-8079 or visit usa.siemens.com/cnc. PALLET CHANGERS REDUCE SETUP TIME The Microcut pallet changer is a quick, precise, low-cost part-changing system enabling increased productivity. According to the company, it can reduce setup time by 30 percent or more, and pallets can be changed over in less than 10 sec. It can also improve part quality and reduce scrap by reducing potential operator load and unload errors, the company says. The system has a mountable receiver with removable pallets, which deliver par t-to-par t change-overs with 0.0002" repeatability. The low-profile precision locating system does not require air, electricity or hydraulics, making it a versatile addition to any vertical CNC machine, g r ind e r o r l a se r m a r k ing syste m. T h e h a rd- anodized aluminum components and hardened and ground tool steel ensure rigidity and wear resistance for long life. The pallets can be configured in different ways. While one pallet is in the machine running, a second identical pallet can be loaded and unloaded. The major difference between the new Direct- Control technology and conventional solutions is that this system per forms all the functions previously assigned to the robot control system. Apart from this difference, Sinumerik Run MyRobot DirectControl performs all the same functions as the previous Run MyRobot variants. The new solution not only enables more dynamic applica- tion of the robot, but also makes for tighter con- trol, improving the capacity for robot operations to run parallel with machining cycles.